The serial number is moved to the rear of the barrel extension behind the sight. The two grooves in each side of the barrel extension side rails are eliminated. Late 1930 commercial models are usually found in the 890000 - 921000 range with production ending in the late 1930's. barrel length 5.25", later 5.5"
You should get a spring kit ( as with ANY older weapon, because the springs weaken with age. Wolf Spring kits are available for $30 or less) and do not fire 7.62x25 Tokarev ammo, EVER! 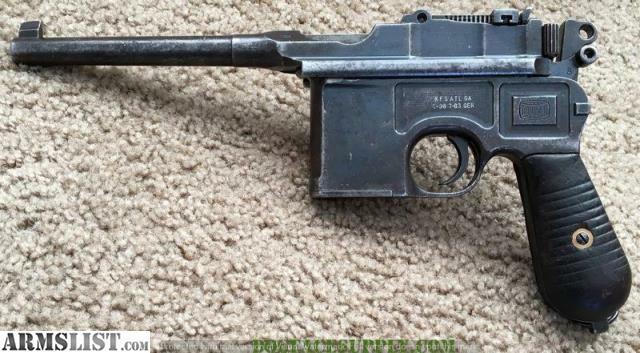 You may find that it chambers and fires OK, but it is really hot and could blow up the M30 and/or wear the parts and barrel out very quickly. ONLY use the appropriate 7.63 Mauser ammo. The pistol is all numbers matching. The grips on these were not numbered. It still retains the original lanyard ring and a lot of the finish. The bore and rifling are in very good condition as well. You don’t see many with good, or ANY rifling. The holster is a very rare variant that was the only one of it’s kind used during WW2 by the Germans. You see some with Kriegsmarine markings, some with Nazi markings and some not marked like this one. Most likely this was a private purchase pressed into service. Looks to me like this was a WW2 bring back holster that some G.I. pressed into service by installing a U.S.G.I. belt hook (holster did not come with pistol). (Please disregard the Japanese Nambu Type 14 cleaning rod in the holster side pouch. It is NOT included). At any rate, it is a very rare holster and is in nice condition. I am willing to sell this as a rig (as chances are you will NEVER find another holster) or separately. 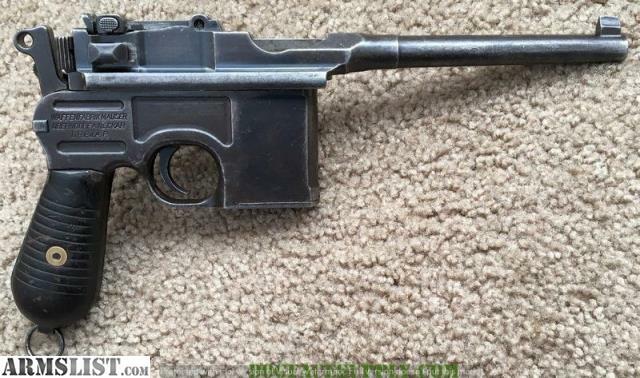 This is cut for a shoulder stock and one CAN be attached leagally (even a repro one).Here is your chance to own a useable Mauser M30 at a great price! This is import marked. Prices are plus actual shipping or 6% VT sales tax in Vermont ONLY. I do NOT charge over my cost to ship! Email me at REDACTED or call Shawn at REDACTED. I take USPS money orders, discreet Paypal gift, or credit cards plus 3.5% of the total. I am an 01 FFL. ANY HANDGUN GOING TO A C&R MUST BE SHIPPED OVERNIGHT VIA UPS (I DON’T USE FED EX). I WILL sell to California. I am all set up to do so. Please go to my website, www.dogfacesupply.com , and scroll all the way down to learn the actual California C&R FFL laws.